The rare Arkansas blue phantoms of black manganese echo the motion of this robust miniature size spray cluster, and the variety between them is reason enough to collect. The tabular main crystal, with a white tabular twin behind it, has a layered phantom amid translucent veils and rainbow foils. Next is a clearer twin with darker phantom, ghost capped. Left of this and also twinned, a split and doubly-terminated phantom. Each major termination has been minimally contacted, yet there is no damage. 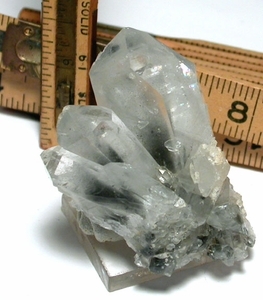 1-1/2x 2-1/4x 2" tall; the main crystal is 7/8x 1-1/4x 2", with a record keeper.